The Itty Bitty Kitty Committee: OK, Who Needs a Prom Date? OK, Who Needs a Prom Date? He's got his tux on and has been practicing his dance moves all weekend. Oh me! ME! Look at that chin and bib. Black kitties and tuxie kitties own my heart...but don't let my Tonk girls hear that! Has he asked Miss Charlene yet? She should get the first dance. I love the little white tufts in his ears. :D so precious! "OMG! A tux! A tux! A tux!" I LOVE tuxes (the kitties and on a handsome man lol). Please tell me there is a cow kitty! Pleeeeeeeeeeeeze? Is that just the lighting, or are his whiskers white on one side and grey on the other? A tuxedo AND a distinguished little moustache! Why hello, little man! You look awfully dapper! I love him! Could he be cuter? So much more handsome than my original prom date. I'll even dig out the dress for him! Hello there Mr. Tuxie!! You are oh so handsome! May I tickle your chinny chin chin? 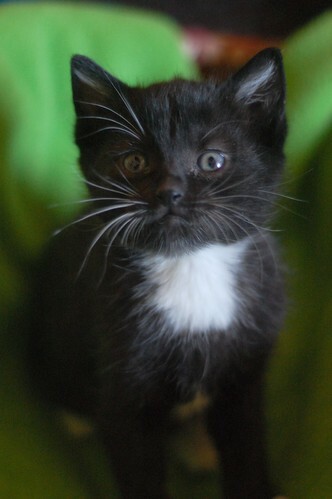 OMG, he looks just like our boy Tux when he was a baby. LOL, the name is not that original but it fit him just right and stuck!! Cutest prom date EVER! And I am sure he is quite the elegant little dancer! He looks very determined about something. Are the white whiskers only on the right side of his face, and the left side black??? Or is that a trick of the light? The white floof in his ears made me think of Grandpa Munster, but this dude is way cuter with the pouty mug & jellybean nose. Such a dashing dude. I'd be tempted to call him Napoleon Solo - those of you who are old enough to remember, you'll know why...devastingly handsome, resourceful and loves the ladies! I love tuxedo kitties! He's such a handsome boy! What a precious little guy. Reminds me quite a bit of my Panda at that age, only Panda has white gloves to go with his tux. Just counted up all the ittybittypictures on the right. Is it really 112? Wowee! Congrats on a job done supurrrlatively well! OMC! They betta form an orderly queue! Love the little up-turned noses! whiskers are all the same color,, it's just the light playing tricks. He looks like he's smiling! !